Convergences, the second series of conversations on urban creativity initiated by Francesca Tarocco and Anna Greenspan in collaboration with Rockbund Art Museum and NYU Shanghai, sees internationally renowned thinkers and practitioners explore, map out andimagine the temporal and spatial landscape of the city. 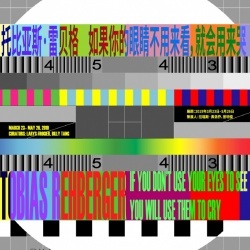 Convergences stagesa set of encounters in space and time, bringinginternational scholars and practitionersto engage with thelocal particularities of contemporary Shanghai culture. Inparticular, the series is interested in how rituals of the everyday connect, collide and converge with art, film and new media. In the first of these conversations, Dr. Angela Zito, associate professor of anthropology and religious studies and co-director of the Center for Religion and Media at New York will present a screening of her acclaimed film Writing in Water. 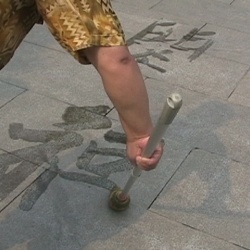 A film on the social life of calligraphy and explore the themes of public space and urban ritual. What does it mean to take up calligraphy in a fast-moving world where people often no longer recall the stroke order of unusual words, but can look them up on cellphones? How does it feel being alone, together, spending long hours training your body to write while slowly mulling over your life with others? Writing in Water follows two generations of calligraphy teachers, Wang Tongxing(王童性) and Liu Lanbo (刘兰波)through the eyes of an American who learned to write with them, in Tuanjiehu Park, Beijing, where they practice writing on the plaza everyday. We encounter directly the funny, philosophically inclined teachers and the community of students, people who have been retired.